Paint Reflections : Painting Techniques| Oil Paintings :: How to Paint Realistic and more! Painting reflections is a lot easier than you think. It is basically a distorted version of the environment of the reflector. If you are painting the three dimensional world then you must first determine the perspective of the reflector. You must first determine if the reflected surface is a smooth surface or a rough surface. The more rough the surface the more distorted the reflection. In the case of the painting to the right the reflection is slightly distorted. This means it is representing a calm surface of water on the beach. 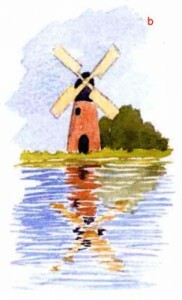 The painting to the left is also a water reflection but the water reflection is more rough, so the reflection is more distorted. It is that simple when it comes to water. When working with a none water based surface like a glass then the shape of the glass is an extra component of the process that changes the perspective. Now you must not only paint the mirror image of the object being reflected along with the distortion of the smoothness of the glass but also the curve of the reflected surface. 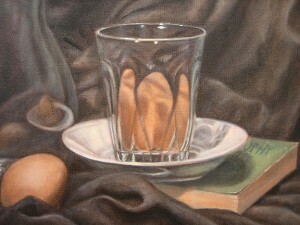 In the case of the painting below, the rock or potato is showing on the glass where the surface is concave and elongated. This creates a funny mirror effect like at a carnival. This would stretch the reflection of the object. Therefore the reflected image is now not only distorted but stretched out of proportion. To truly understand how to paint all reflections on canvas you must understand the three components listed here. The angel of the reflective surface. The smoothness of the reflective surface. The shape of the reflective surface. 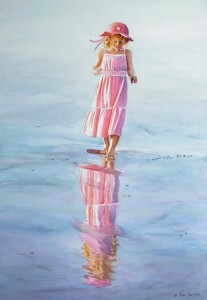 I would recommend that you start learning with a water reflection and then continue on to the glass or object based surfaces. Always work with a still life setup or a picture. Also practice with charcoal and paper focusing on darks and lights as shadows and highlights then you can upgrade to color with acrylic and on to oils. To recreate life you must first understand it. This article really helped. Thanks so much!